Block system, research and teaching – oh my! It’s been a while since I last wrote and I have to say I’ve missed it a lot! The rest of August was packed with work – we even worked on the day that we left for the flight back to Budapest. It will all be worth it when we get our pay checks, but it was quite tiring then! We started school the day after we got back. This should be a calm semester – we have the block system now, so we only have one subject for 1 or 2 weeks at a time – but I don’t think I’ll ever experience “calm”. The reason my semester isn’t calm has to do with something I never could have imagined happening: I’m teaching anatomy! Along with my friends Dushyant and Amir, we are the three 5th years students who each have our own group in anatomy. It’s a huge honor and I feel so lucky to have been offered this opportunity. It’s also A LOT of work! I teach 3 classes a week (one histology and two in the dissection room) and outside of that I spend maybe 10-20 hours a week preparing/reviewing for the class. This semester we are focusing on the locomotor system (all the muscles, movements, nerves, vessels etc. of the upper limb, lower limb and thorax). I absolutely love apps/technology/organizing and teaching this class is giving me the chance to let my technology freak flag fly high! In order to share useful sources, links, notes etc. 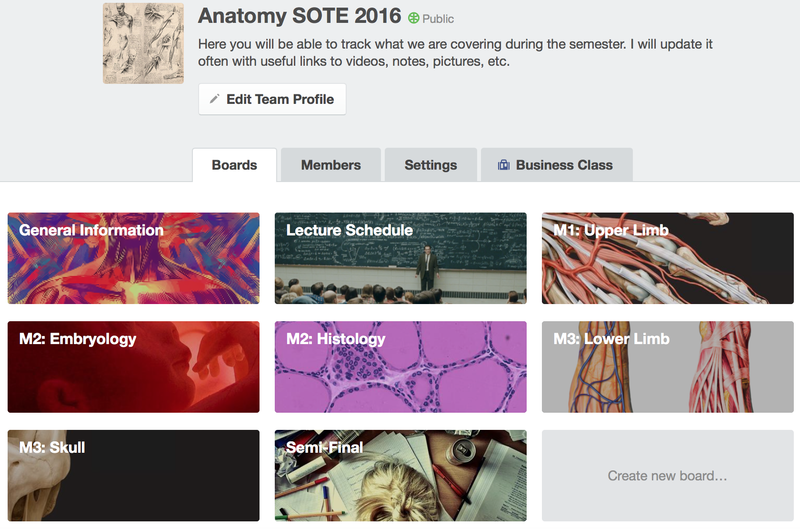 with my students, I’ve created a page on a website called Trello. It’s more of a project managing site for companies, but I feel that it also works really well for teaching. I re-organized it last night (one of the keys to success is constantly evolving your tactics, right? ), so now it shows each board by topic. Previously, I had organised by week, so that they could follow along during the weeks of the semester. With midterms approaching, I think it is more efficient to have everything in one place. When you go into specific boards, you can see that different topics or weeks are divided into separate lists. Each list is composed of various cards. When you click on a card, it will open up to a smaller window and show you the details included in that card. 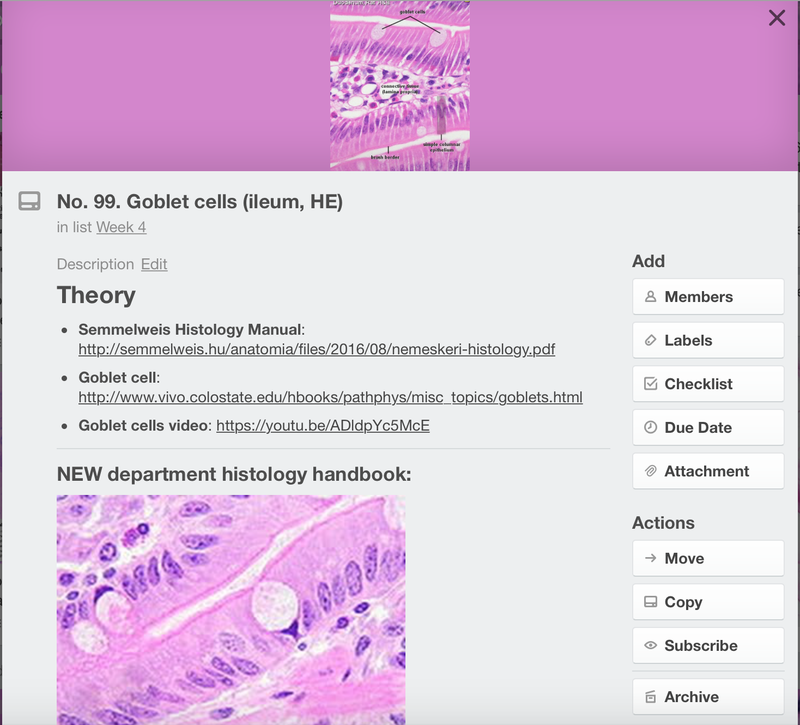 For each histology slide, I include links to videos or websites covering the theory, details from the new histology guide written by the department, details from the old histology guide (which I feel has more detail and information) and then at the end, a picture of my own notes for that slide. In addition to Trello, I use the website Memorang for creating flashcards. I’ve used this app before for previous courses and absolutely love it. I do prefer traditional, hard copy flashcards, but the benefit of this site is the algorithms (if you get a card wrong, it intermittently repeats it until you hate it) and the statistics (it gives you percentage progress with each card and with the deck). My students have access to the cards and I can see the top students on the leaderboard for the different sets. On the online version of the site, there are different testing methods – which can be really great when you are tired/bored with studying and need a little kick. 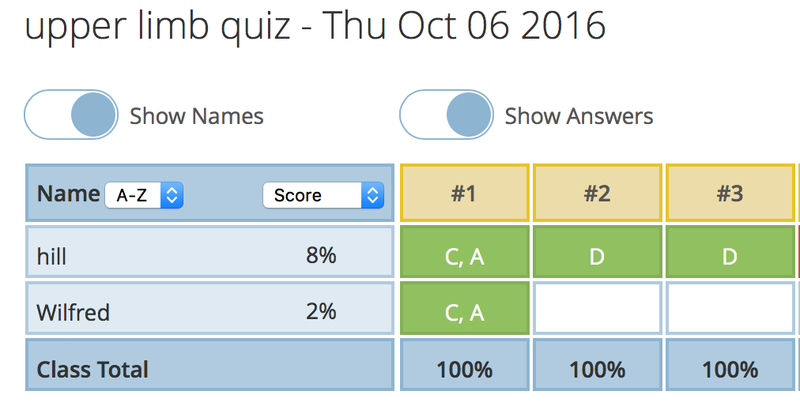 I use the multiple choice option the most, but the traditional flashcard version is great when you need to first learn the material. 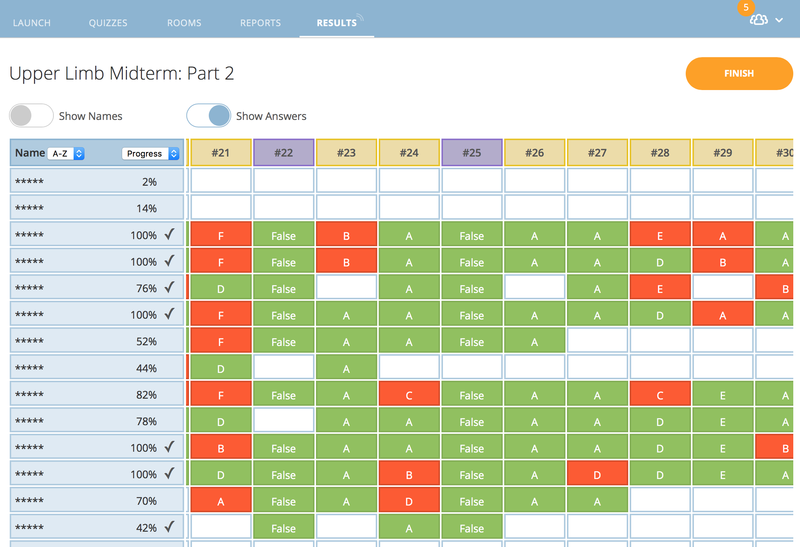 Another program/app that I’m using – or will start using today – is called Socrative. 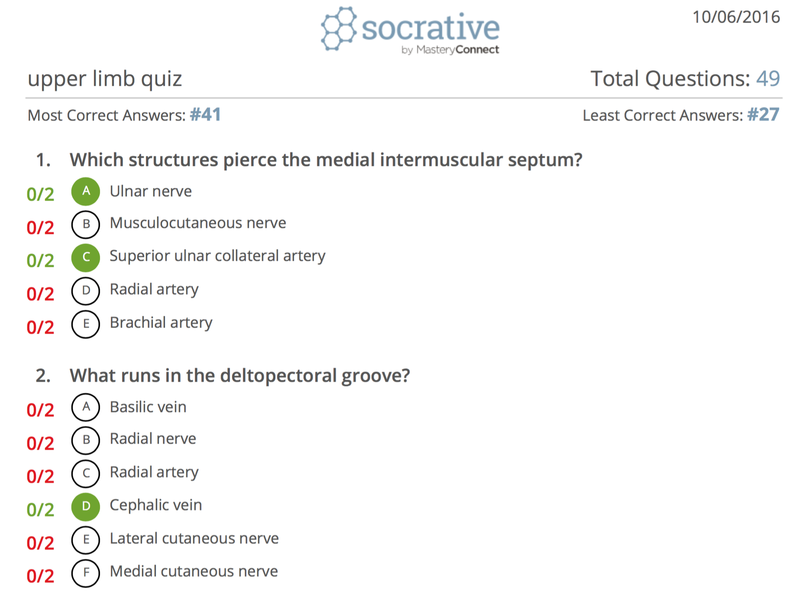 I really like how online quizzing systems can be integrated into the classroom/lectures. I’ve heard that one of the pathophysiology teacher has started doing it in his lectures and one of our internal medicine teachers did it during one of her presentations. It’s such a great way of keeping students engaged and interested. I’m not sure how I will integrate it into my practical classes, so for now I am using the site to arrange online quizzes that the students can do at home. My friend Amir and I have created almost 100 questions that we will launch in two rounds. My group will have their first quiz today and their second on Tuesday evening. I will open the quiz for 1.5 hours and can track their progress throughout that time. At the end, I can download reports that are either (a) question specific or (b) student specific, which the students can then print out and use to study from late. In addition to teaching, I’m doing research with two departments: Department of Surgical Research and Techniques and Department of Public Health. If all goes well – which I’m sure it will, after a lot of hard work – I will present my work in both departments at the TDK conference (Student Research Conference) in February. I had a really great experience with my 2nd semester public health professor and he has offered to be my thesis advisor. There are a couple of potential projects I can consider for my thesis (which must be completed by the end of 6th year, but which should be started – at least – by 5th year). I won’t tell about any of them yet – don’t want to jinx myself! With so many different departments, possible topics and potential thesis themes and advisors, I feel lucky to have a place to start. I’d hoped to make this post longer and a bit more informative, but at this point I just need to press “publish”! I’ve sat down to write a new post countless times in the past two months and always get interrupted by something :P.
Tomorrow I will be examining 1st year medical students for their first midterm (covering the entire upper limb) all day. There are exams at 8:00, 10:00 and 14:00 and I’ve agreed to be there for all of them. It still amazes me how different things are now and how crazy it would be to go back and tell my 1st year self where I am today! To get an idea of what the students need to know for their exam, check out the checklist I made for my group. That’s a lot of new vocab to learn! Ok, off to Memorang flashcard land I go! Meanwhile, my students are finishing up their second quiz. I love being able to follow along live. The quiz Amir and I made is really, really tough (designed to make them think and use their knowledge), so I’m not too worried about the incorrect questions. § 2 Responses to Block system, research and teaching – oh my! You are currently reading Block system, research and teaching – oh my! at Buda-B.